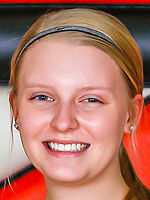 Elk Mound junior Sophie Cedarblade won the WIAA 3-Point Challenge on Saturday in Green Bay. GREEN BAY — Elk Mound junior Sophie Cedarblade won the WIAA 3-Point Challenge on Saturday morning at the Resch Center in Green Bay. Cedarblade bested McDonell’s Maggie Craker in the finals by a score of 18-16 to win the title. Cedarblade scored 18 points in the opening round and 13 in the semifinals. The Elk Mound junior won a shootoff over Mineral Point’s Mallory Lindsey to advance to the finals to face Craker. Natalie Cerrato of De Pere also advanced to the semifinals with a score of 16. Other participants in the 10-player competition were Chippewa Falls’ Aaliyah McMillan, Pewaukee’s Sarah Newcomer, Kewaskum’s Maxine Paulowske, Waupun’s Abbie Aalsma, Lancaster’s Devin Wagner and Loyal’s Remi Geiger. The 3-Point Challenge is in its fifth season and takes the top-two shooters in each of the five basketball divisions. Cedarblade was an All-Dunn-St. Croix Conference honorable mention selection for the Mounders this season. Cedarblade was second on the team in scoring, averaging 8.6 points per game, according to WisSports.net. The junior made 48 of 114 3-point attempts during the regular season, good for a 42.1 percent success rate.